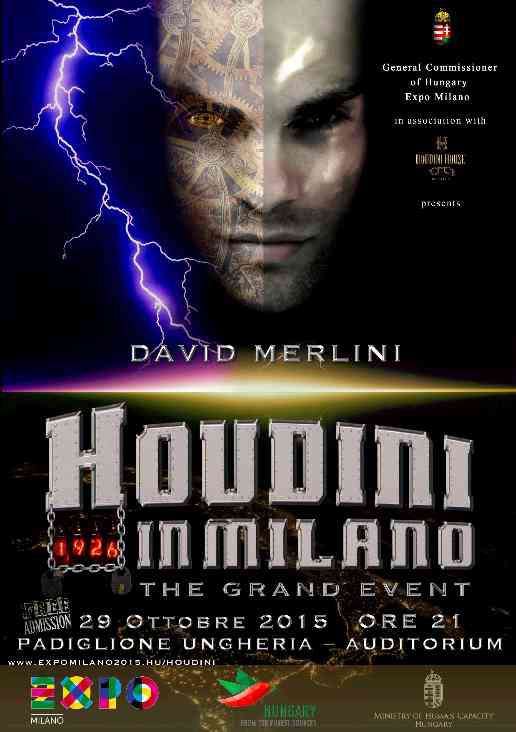 We are proud to invite you to the first Houdini Exhibiton in Europe, at the Hungarian Pavilion of Expo 2015 in Milan, Italy. Join us for an amazing journey in time! The Collection features unique memorabilia, artwork, handcuffs and secret devices of The Greatest Escape Artist in History: Harry Houdini. Free admission - limited seats - make sure you register and book your seat here. This 18th of August marks a special anniversary for me. 20 years earlier, with a small team of friends I embarked on a special journey. It all started on the main stage of Sziget95, an outdoor summer festival in Budapest, Hungary. Strapped in a straitjacket, suspended upside down under a rope set on fire, before the headliner band hit the stage. It was just a 5 minutes performance, but it took months of preparations on my side. I was driven by the energy and willingness that only young kids have. Today I call it passion. Almost 2o years later, I am happy to welcome you to our freshly updated website, and to celebrate with a videoclip featuring some of the most memorable moments of my career, inspired by a day on the road.